There it was in the bookstore. A book called The Hobbit with a cover picture of a dragon soaring, an arrow embedded in his breast. I picked it up and opened it -- the runes and end paper maps were intriguing. Quickly I bought the book and was soon following Bilbo's adventures as he made his way towards The Lonely Mountain. The author's name I recognized as a close friend of C.S. Lewis, an author I had recently discovered. I was reading his autobiography, Surprised By Joy, at the time. The next time I visited the library I looked under "T". The red cloth-bound volumes stood out. In great excitement I opened them. The Fellowship of the Ring had much more about hobbits. I borrowed it and began another stage of discovery. An American friend lend me a book by Clyde S. Kilby called The Christian World of C.S. Lewis. This introduced me to the Inklings, the literary group of friends to which Tolkien and C.S. Lewis belonged. A world was indeed opening up. Soon I was reading all I could find of another central Inking, Charles Williams, as well. The affinities between the friends fascinated me. By then I had started university study and before long I found myself comparing Tolkien's idea of sub-creation with certain of Leonardo Da Vinci's ideas in his Notebooks, finding a similarity in their ideas of invention and disciplined imagination -- a kind of "exact fantasy". They were concerned with capturing the world in miniature. As a student of English Literature and philosophy I was hooked by the potential of counterfactual writing which used parable and fantasy, relying on sharp storytelling and narrative skills and enlarging human knowledge and even sensations in the process. What normally is isolated in the abstract is made concrete and real. Furthermore the big questions humans ask are explored. Tolkien developed my taste for worlds. Some of my earliest published writing was on C.S. Lewis, Tolkien and the Inklings. Looking back over 30 years later, my interest in these writers is undiminished. The richness they embody has not been exhausted. I find their interrelationship endlessly fascinating, which is why I have recently written Tolkien and C.S. Lewis: The Gift of Friendship (subtitled The Story of Their Friendship in the British edition). Tolkien today needs no "J.R.R. ", being as well known as Wordsworth and perhaps Shakespeare. Lewis still needs his "C.S. ", but his popularity has steadily increased since his death 40 years ago, and is set to grow even more when a major film of The Lion, the Witch and the Wardrobe appears in a year or so, a natural follow on to Peter Jackson's The Lord of the Rings. When I discovered Tolkien I was unaware of the burgeoning interest in him emanating from the United States. For myself, I am glad I discovered him independently, for I know that I was attracted by the quality of his writing and imagination, not because of a vogue. I'm also glad however that the vogue is founded upon quality -- it grew from the many people like myself who discovered a momentous writer. Tolkien's work has a remarkable power to bring diverse people together -- he is a global phenomenon. I have valued the conferences I've attended and the friends I've made in The Tolkien Society. When it comes to Tolkien, academics and fans rub shoulders in what is perhaps a unique and certainly a remarkable way. Colin Duriez is author of Tolkien and C.S. 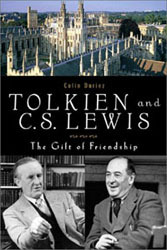 Lewis: The Gift of Friendship, Tolkien and The Lord of the Rings, The C.S. Lewis Encyclopaedia and, with David Porter, The Inklings Handbook.